The classic shape of the Marcos was updated with the launch of the Mantara in 1992 and small volume Type Approval obtained as the car was 'standardised' through production and conformed to various safety and emission regulations. The increasingly difficult and now outdated Triumph front suspension was replace by an up to date Ford front knuckle assembly. The Marcos system incorporated a McPherson strut damper, coil spring and anti roll bar based loosely on the Ford system. In an attempt to appeal to a more diverse audience and make the driving experience more pleasurable, with the Mantara being the first Marcos with power assisted steering. The Marcos chassis chassis was altered at the front end to accommodate the new suspension design and with a wider front track, the front end was significantly updated from its predecessor the Mantula. The main visible styling changes being to the bonnet, rear wheel arches and rear lights in an attempt to give the car a more modern appearance. Changes also included, a revised steering column and switch gear changes to the dashboard including revised heater controls. Streamlining production in 1995 in an attempt to reduce build costs, saw additional changes. The steel replaced fibreglass in the footwells. The wooden dashboard supports were replaced with steel and the door frames were simplified by the removal of the quarter light and the introduction of a one piece drop-glass. Engine option in the Mantara ranged from the standard 3.9, 4.6 and 5.00 NCK with sports pack, developing a claimed 320 bhp. 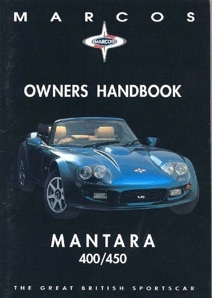 A small engined variant of the Mantara was introduced in 1997 and with a lower insurance premium it was hoped it would appeal to the younger driver. Powered by the Rover Tomcat 2.0 litre engine, the GTS was available in both turbo and non turbo form. The only other distinguishing feature of the 2.0 Litre GTS cars was the bonnet. This was a further progression from the Mantara bonnet incorporating much smoother lines, flared in back mounted headlamps, and a deeper spoiler, which was used on the later Mantaray model. A handful of late Mantara V8's were produced with the same bonnet as the 2.0 litre models. Once again, Marcos attempted to go upmarket, but this time, with a little more success. In 1992, it left the kit car business, and introduced the Marcos Mantara – a further extension of the original GT styling, which by this time appeared as if it had been on a course of steroids. Once again, the Rover V8 (now in 3.9- and 4.6-litre form) provided the power, and once again Marcos found itself going head to head with TVR. The Mantara ended up campaigning in GT racing, with the ultimate version – the LM600 – powered by a 6-litre Chevrolet V8.